Encourage your students to get to know John Keats and how to increase descriptive writing about winter and nature with this poetry analysis activity. 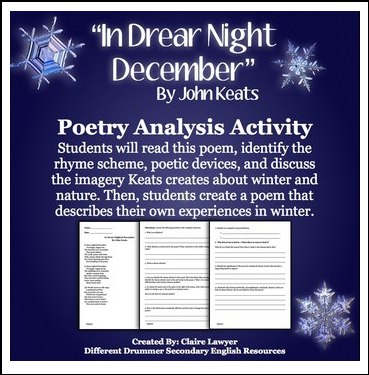 Students will read "In Drear Night December" and analyze the rhyme scheme, allusions, and the differences between the stanzas, looking specifically how the tone and meaning of the poem change from the two first stanzas to the third. They will analyze the meaning behind Keats' famous line, "The feel of not to feel it" and research his life and losses to see if there is a connection. Please leave feedback for this product! I would appreciate it!